Now step inside and this is when you can’t make any difference between the A siblings if you are not a keen observer. Only way to feel the difference is the seat height, which is slightly above the average sedan height but in the world of SUVs, it is still low. What changes in the GLA facelift you ask? Well, nothing major apart from the new three-spoke steering wheel, ambient lighting with 12 colours and a bigger 8-inch infotainment display that now comes with Apple CarPlay and Android Auto connectivity. The steering now has a 3D effect to it, the horn pad jutting out, looks nice. The screen is bright and clear but it’s not touch, you have to control it via the COMMAND system knobs. Otherwise everything is similar and the dashboard looks quite attractive, specially the slightly updated instrument cluster. I also like the way the aircon vents are styled, practical yet flashy. However, I really can’t digest the fact that a Rs. 40 lakh + Mercedes doesn’t come with auto climate control! It doesn’t even have a reverse parking sensor but thankfully gets a camera. What you would like in the GLA is the fantastic quality, consistency and the feel of materials. Everything is top notch, the equipment list is quite strong too, push button start, panoramic sunroof, electric seats, driving modes, electric tailgate, etc. The seats also get soft leather which smells nice too. Now the rear seat experience is average if you have the SUV practicality in mind because headroom for tall passengers is limited and because of the huge transmission hump, the middle passenger might find it a squeeze. The tailgate now is electrically operational. The boot is quite big and accommodating but the spare space saver wheel just eats up a lot of space. The Indian variant comes with increased ground clearance and rightly so. All throughout our journey the GLA sailed over the worst roads and the biggest speed breakers without any problems. Ride quality is quite supple over most surfaces however sharp bumps tend to upset it and this was experienced more so in the diesel variant. The heavier diesel engine could mean a slightly different suspension setting and we think this might be the cause of the diesel variant feeling stiffer. The GLA comes with 18-inch wheels with a 50 profile tyre. We feel a 17-inch rim with a slightly higher profile could have definitely added more cushion to the ride quality.Handling was quite predictable and the GLA went around corners quite happily. The increased ground clearance means there is some roll, but its always controlled. Front wheel drive meant the GLA does understeer when pushed hard, but with 235 section tyres you really have to drive like a hooligan to reach the tyres limits. There are some Android users who find their phone value for money and there are some Apple users who are addicted to the ecosystem and feel satisfied using the expensive phone. Same is the case with feature loaded full-sized 7-seater SUVs and compact luxury SUVs. Those who are living the ecosystem of luxury cars and can afford a Rs. 40 lakh compact SUV, the GLA is a beautiful car. You not only arrive in style and turn heads on signals but you also feel relaxed and comfortable driving the Merc. 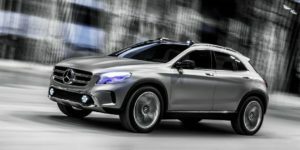 The improvements that come along with the GLA are appreciated because it looks more SUV, offers better features inside and gets a stronger engine. However, if you are a big driving enthusiast and don’t care about the extra Merc bling, then you might want to consider the rivals.